Over the past 8 years, since the release of No Stranger to the Skies in 2000, California prog rockers Glass have seen an unprecedented renaissance in their musical career. It has been unprecedented because success eluded them during their original run in the 70’s. Now, with several archival releases under their belts, as well as a new studio album, a number of solo side project releases, numerous stateside live festival shows and a European tour behind them, Glass, with their original line-up, have finally found that success that eluded them in their younger years, and that success suits them well. You can hear it on this live outing culled from performances primarily from the Progman Cometh Festival in 2002 but also from Progman Cometh 2003 and BajaProg 2002. 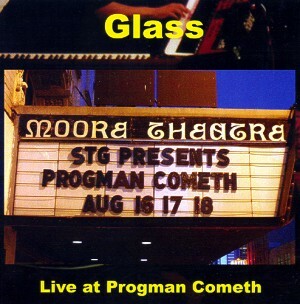 The Progman 2002 performances, covered in two lengthy sets comprising suites of both old and new material (including music that has not appeared on any other Glass albums before), and one short “intermission” performance, find the band relaxed, having found a perfect synergy in playing together. There is nothing forced or difficult here. Not to say that the music isn’t complex. Glass do come from the old-school of classic, progressive rock, with lengthy complex arrangements, multiple time signatures, and virtuoso playing. When I say there’s nothing difficult here, I mean that it’s all played seemingly so effortlessly. Here’s a band that is at home on the stage, obviously loving what they are doing. Glass’s sound was always a pioneering one. Their dual keyboard, bass and drum line up featured very little in the way of guitar, unusual for any rock band. Their use of electronics and synthesizers was innovative and challenging. For their live show, Glass has fleshed out that sound, adding new dimensions to the original compositions and to their sound in general. Most notably is the inclusion of the now sadly departed Elton Dean on Saxello and Alto Saxophone. Dean brings an added warmth and richness to Glass’s sound, and obviously an added jazzy element as well, that fits in perfectly with the Glass compositions. This is not a surprise, as Dean’s old band, The Soft Machine, was a major influence on Glass in their early years. Pete Pendras also adds acoustic and electric guitars to the first set and Bill Kopecky adds fretless bass and Paul Kopecky adds snare drum to the second set. Paul Black, the second drummer for Glass in their original 70’s era phase also makes an appearance on the album. I like the fact that the band took several shorter pieces and arranged them into lengthier suites. It recasts the older pieces in a new light, and gives the newer material space to breathe and come into it’s own. Set one, collectively called Dedicated to Mike (but we can’t find him), starts off rocking with some great synth playing from Greg Sherman and punchy rhythms coming from bassist Jeff Sherman and drummer Jerry Cook, but it veers off surprisingly into a very interesting free jazz passage, tied together with a pulsing synth that evolves into a loose, lazy rhythm, with Mellotron flute, Dean’s sax and Pendras’s jazzy guitar adding atmosphere. It ends with a spirited and funky guitar-led romp full of tinkling piano and jazzy nuances. Miles, Monk, Elton and Mom (Dean’s name was added into the original title) was a piece from Jeff’s first solo album, and here it’s a gentle interlude between the sets that features a superb, heartfelt performance from Elton Dean. Set 2, collectively called The Catch, starts off rocking again, but this time eases off into a long spacey and symphonic section featuring an old Glass classic, Patrice Mersault’s Dream. Things pick up with the march-like and symphonic War Song, before ending on a lighter note with the beautiful keyboard oriented romp of For Ursula Major and Sirius the Dog Star. And that is the Progman Cometh 2002 show. But the CD still has a lot more to offer, nearly 20-minutes of music taken from performances at Progman Cometh 2003 and BajaProg 2002. First up is the moody and minimalist Big Sur 9-14-2000, another track from Jeff’s first solo album, that greatly improves on the original by having a live drummer instead of the programmed percussion Jeff used on the studio version. It’s also a more lush arrangement, with help from Hugh Hopper on bass and effects, Richard Sinclair giving a lovely layered, wordless vocal performance in the middle of the piece, and Jim Smiley adding in sampled sounds. Last up is another Glass classic, one of my favourites, the superb No Stranger to the Skies, a majestic space prog excursion that makes for a perfect end to the album. This disc is an excellent musical document of the fascinating story of Glass, the little prog band that could, and did become a force to reckon with. If you’re a fan, especially one who hasn’t had a chance to see them live, this album will certainly be a treat, but it’s also an excellent place to start if you’ve not heard the band before at all. The Progman does indeed Cometh, and his name is Glass.